Saturday Night Live Takes On Brett Kavanaugh [VIDEO] - Joe.My.God. 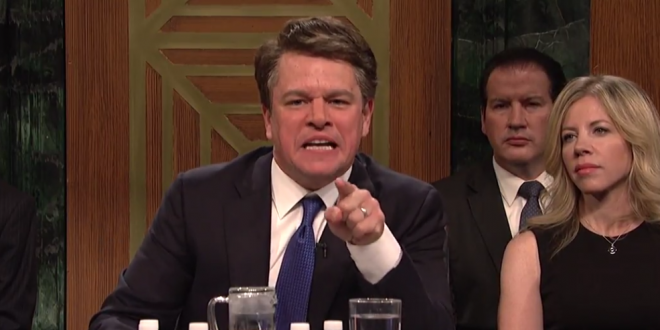 The sketch gave just about everyone on the SNL cast a chance at the Senate – Kate McKinnon, of course, was Senator Lindsey Graham, Chris Redd was Cory Booker, Pete Davidson was Sheldon Whitehouse, getting the chance to introduce to SNL the concepts of boofing and Devil’s Triangle. Ex-SNLer Rachel Dratch returned to play Sen Amy Klobuchar, recreating the dueling Do You Drink Beer? moment. A cardboard cut-out of Alyssa Milano played Alyssa Milano. The cast did not miss the chance to mock some of the senators on the judicial committee, taking aim at Senator Lindsey Graham. When the floor was yielded to the Republican senator, Graham, played by Kate McKinnon, mocked the senator’s support of Kavanaugh. “I know I’m supposed to shut up because I’m a single white male, 5’10” uncut. But I will not shut up because this is a bunch of crap,” he said. Just when I thought the #WHCD set the standard for depravity, #SNL mocking a man who courageously stood up for his own dignity and his family marks a new low in what passes for “comedy” these days.